(Nanowerk News) There are no effective available treatments for sufferers of Glioblastoma multiforme (GBM), the most aggressive and devastating form of brain tumor. The disease, always fatal, has a survival rate of only 6-18 months. Now a new Tel Aviv University study may offer hope to the tens of thousands diagnosed with gliomas every year. A pioneer of cancer-busting nanoscale therapeutics, Prof. Dan Peer of TAU's Department of Department of Cell Research and Immunology and Scientific Director of TAU's Center for NanoMedicine has adapted an earlier treatment modality -- one engineered to tackle ovarian cancer tumors -- to target gliomas, with promising results. 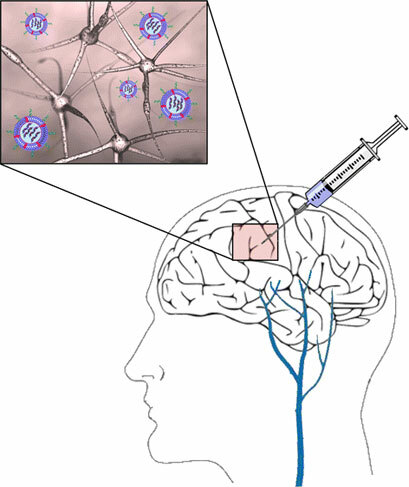 Published recently in ACS Nano ("Localized RNAi Therapeutics of Chemoresistant Grade IV Glioma Using Hyaluronan-Grafted Lipid-Based Nanoparticles"), the research was initiated by Prof. Zvi R. Cohen, Director of the Neurosurgical Oncology Unit and Vice Chair at the Neurosurgical Department at Sheba Medical Center at Tel Hashomer. The Israeli Cancer Association provided support for this research. "I was approached by a neurosurgeon insistent on finding a solution, any solution, to a desperate situation," said Prof. Peer. "Their patients were dying on them, fast, and they had virtually no weapons in their arsenal. Prof. Zvi Cohen heard about my earlier nanoscale research and suggested using it as a basis for a novel mechanism with which to treat gliomas." Dr. Cohen had acted as the primary investigator in several glioma clinical trials over the last decade, in which new treatments were delivered surgically into gliomas or into the surrounding tissues following tumor removal. "Unfortunately, gene therapy, bacterial toxin therapy, and high-intensity focused ultrasound therapy had all failed as approaches to treat malignant brain tumors," said Dr. Cohen. "I realized that we must think differently. When I heard about Dan's work in the field of nanomedicine and cancer, I knew I found an innovative approach combining nanotechnology and molecular biology to tackle brain cancer." Dr. Peer's new research is based on a nanoparticle platform, which transports drugs to target sites while minimizing adverse effects on the rest of the body. Prof. Peer devised a localized strategy to deliver RNA genetic interference (RNAi) directly to the tumor site using lipid-based nanoparticles coated with the polysugar hyaluronan (HA) that binds to a receptor expressed specifically on glioma cells. Prof. Peer and his team of researchers tested the therapy in mouse models affected with gliomas and control groups treated with standard forms of chemotherapy. The results were, according to the researchers, astonishing. "We used a human glioma implanted in mice as our preclinical model," said Prof. Peer. "Then we injected our designed particle with fluorescent dye to monitor its success entering the tumor cells. We were pleased and astonished to find that, a mere three hours later, the particles were situated within the tumor cells." Rather than chemotherapy, Prof. Peer's nanoparticles contain nucleic acid with small interference RNAs, which silence the functioning of a key protein involved in cell proliferation. "Cancer cells, always dividing, are regulated by a specific protein," said Prof. Peer. "We thought if we could silence this gene, they would die off. It is a basic, elegant mechanism and much less toxic than chemotherapy. This protein is not expressed in normal cells, so it only works where cells are highly proliferated." 100 days following the treatment of four injections over 30 days, 60 percent of the afflicted mice were still alive. This represents a robust survival rate for mice, whose average life expectancy is only two years. The control mice died 30-34.5 days into treatment. "This is a proof of concept study which can easily be translated into a novel clinical modality," said Prof. Peer. "While it is in early stages, the data is so promising -- it would be a crime not to pursue it."